There’s a rebellion stirring in the jungle village of Ppentaca. Totec, a former slave, has cultivated a force of 500 warriors. He intends to invade the Feathered Kingdom in the valley and ignite a slave rebellion in the capital city of Ocochac, where the slaves outnumber their masters. But first they must slay a child to win the favor of the gods. Ixmal, Totec’s son, tries to stop the blood ritual, creating a chain of events that will reach Biblical proportions. Will there be time to stop the chain of events from reaching its zenith? To see how these chain of events unfold, David Bolton, the author behind ‘Love Thief, the Legend of Ixmal the Healer’ and I have caught up to chat today. David, we don’t often see books showing life in jungle villages, what inspired you to explore this world in your book? THE STORY BEHIND THE STORY… Deep in the highland jungles of Chiapas, Mexico, stood Palenque, a classic Mayan ceremonial center. Among the ball court, observatory, and Temple of the Moon rose the Temple of Inscriptions, a nine-tier pyramid. Many times I walked the steps that led into the bowels of the pyramid. In the tomb at the bottom, I would gaze at the glyphs on the slab that once covered the remains of a six-foot man with a jade mask. Carved into the stone was the image of a Mayan warrior, perhaps a king, going from this world to the next. He flew toward a flowering cross that connected all things: life and death, sky, earth and the underworld. Who was this man? What was his story? The end of the saga came to me one warm afternoon as I was perched atop the pyramid, a vision so pure it brought tears to my eyes. Now all I had to do was write the story to get to that ending. The task would take many years and rewrites. Can you share a little of this journey that you took to get to the ending with us? My novel has been a journey in itself. Years ago I wrote the first draft under the title of Rainman (before Tom Cruise) and I had an agent in San Francisco (where I was a cabdriver in the 70s) and Elizabeth Pomada came close to getting Rainman published with Putnam but it did not work out. I am glad it didn’t. Otherwise, I would not have the version that I have today. Has this version allowed you to travel and have experiences that helped you get to this version? Of course, I have traveled extensively in Central and South America. My Spanish teacher, Pedro Lucas (Centro Maya in Xela, Guatemala) was an invaluable source for language, myths, and stories. I have visited many Inca, Aztec, Toltec sites as well as the Museo Nacional de Anthropologia in Mexico City. What did you learn from translating all of your experiences into this story? Experiencing the richness, mystery and magic of the pre-Columbian culture. I love that you’ve immersed yourself into the mystery and magic so much that it built such a rich tale. There’s so much that we could cover about the different layers, but is there a central idea that you really wanted readers to take away from the tale? Do you often think of the Creator as you’re writing, or do you tend to focus your mind on something else? When I am rolling, the focus is totally on the characters, internal and external. They drive the plot. Earlier you mentioned that this plot has changed over the course of the different versions of your book. How do you feel that your voice as an author has changed from the first version, to what readers can see today? I owe a lot to my daughter Stephanie. When I was teaching writing at the University of Maryland a few years back, she read Rainman and had this comment: “Dad, it’s a great story, but you wrote the women characters from a point of view of man.” A light went off in my head. Of course, I wrote them as Hemingway would; I was 26 at the time. I had not been married three times and raised two daughters. I’m a much better writer at 68. Now the female characters are very real and complex. I love them! I love that you’ve taken the time to gain the life experience to do your characters justice, I’m sure that choice has made both the reading and writing of the book much more satisfying. Reflecting on these choices, do you feel that the steps you’ve taken have helped to make the writing process energising for yourself? Or did it get a bit much over the years? Writing is something I must do. As Albert Camus once said, art gives one’s life order. Yes, it can be exhausting, daunting, and sometimes depressing, especially when one is stuck on a page and the ideas are not flowing. But there are few things better when those words are flowering and the characters take hold of the plot and develop a life of their own. Since you’ve invested so much time to ensure your work is the best that it can be with regards to things such as plot and character development, I’m curious to find out if you’ve also thought about how you would market your audience so that it can reach as many readers as possible. What are your thoughts on this area? I have no illusions about the novel becoming a NYTimes best seller, though it is a helluva story, one that will “stick” with a person. It carries a timeless message, one most appropriate for these times. I just want it read. Maybe it can spread a little light in these turbulent times. I hope it can spread a little light too. As a person who must write, have you thought about working on another project that might contrast or compliment this book, and share even more light in the world? I have been a professional writer for most of my adult life. Right now I am writing a blog on India (see www.lovethiefnovel.com), poetry and short stories. I am also doing research for a sequel to the book. I was interviewed by Fox45News about the book (see web page for video) and was asked if there would be a sequel. I had to say yes. I love a good sequel! Especially if it gets to you think a little, like the next step of brain-building queries that I’d like to try on you next. Let’s start building new brain connections with the conundrum, if money doesn’t grow on trees then why do banks have branches? All the better to hide the money from the tax man. Which is handy when you need to do cool things with money, like have a Batmobile. And if you were to consider Batman and his cool life, what do you think would happen if Batman was to be bitten by a vampire? Poor Robin, he always ends up in the worst position. What is your favourite word? We all love love! And if you could use your love to create an awesome new animal, what would you make? Now, that’s an animal that would be in high demand, and perhaps for its sake, it’s best that it doesn’t exist. We’ve had so much fun exploring worlds of myth and magic, but we’ve run out of time, so can you wrap up our chat today by sharing your philosophy for life? Wherever you go, there you are. Or, in the words of Ram Dass (Richard Albert), “be here now.” I have lived a very interesting life, a rich life, because I followed my bliss, to coin a cliche. And I thank you so much for sharing a taste of it with us today. David, I’ve enjoyed our chat and you’ve got me thinking about Ppentaca so much that I’m going to have to go back to Love Thief, the Legend of Ixmal the Healer and see it again. Excited to read the book we discussed today? Find it here on Amazon: ‘Love Thief, the Legend of Ixmal the Healer ( ASIN: B07KBFHHGC )‘. 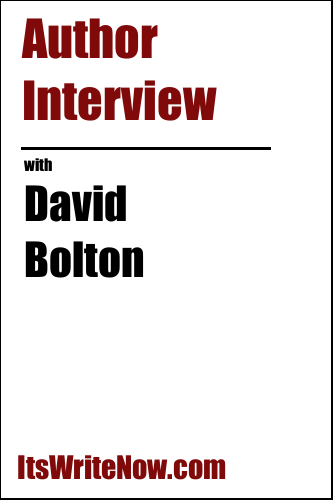 Want to find out more about David Bolton? Connect here!